The Service Bus has a built in integration with Coherence that doesn’t require the use of the JCA Coherence adapter. It is called Service Result Cache. 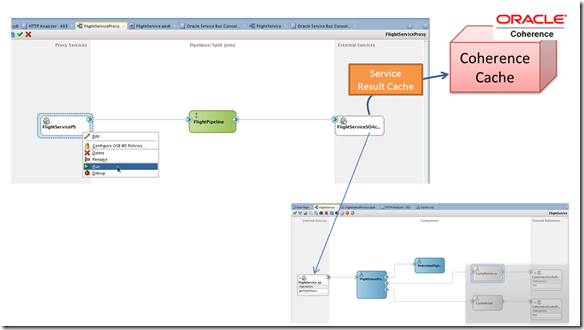 Business services can be configured with the Service Result Cache, to cache the response from the business service for future use. The expiration time of the cached response is configured, as is the expression to derive the key under which the response is cached. All that is required to leverage this Service Result Cache is a little declarative configuration. Compared to the Coherence adapters we have seen in action earlier in this chapter, we lack the ability to explicitly reset the values in the Service Result Cache, for example when some event tells us the cached data has grown stale. Simply put, Result Cache is easier to configure, but more limited in functionality than the explicit use of the Coherence Adapter. 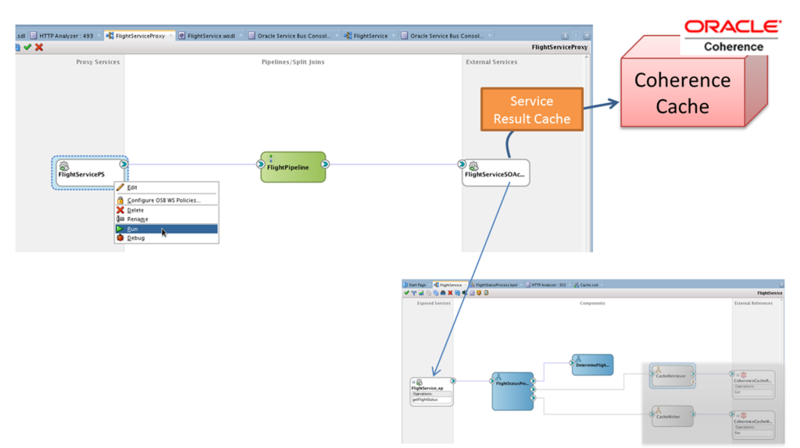 We will see the Service Bus service result cache in action for a wrapper FlightService on the Service Bus that routes to the FlightService SOA composite. We will disable the cache support in the SOA composite, feel the effects and then switch on the service result cache to provide the cache fueled response acceleration again. The end result for this section is in the Service Bus service FlightServiceProxy.